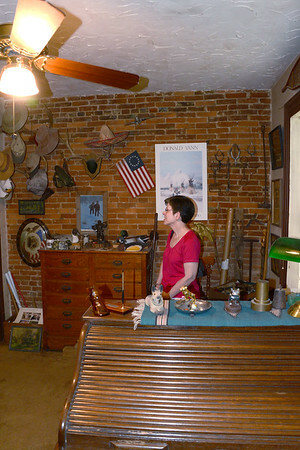 Markle’s Mill was one of the first industries established in what later became Vigo County. Built in 1816 by Maj. Abraham Markle, The mill was for many years the means by which a farmer could convert his crops to marketable products. 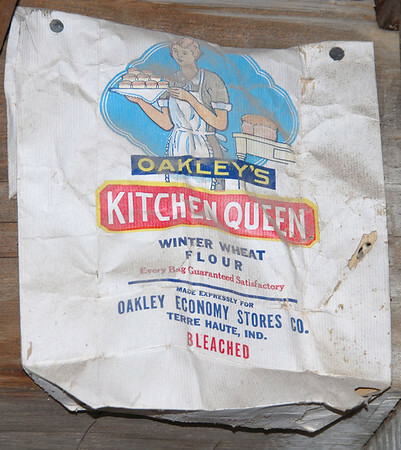 For one hundred twenty-one years the mill served Vigo County farmers and produced much of the flour, meal, and feed for the area. 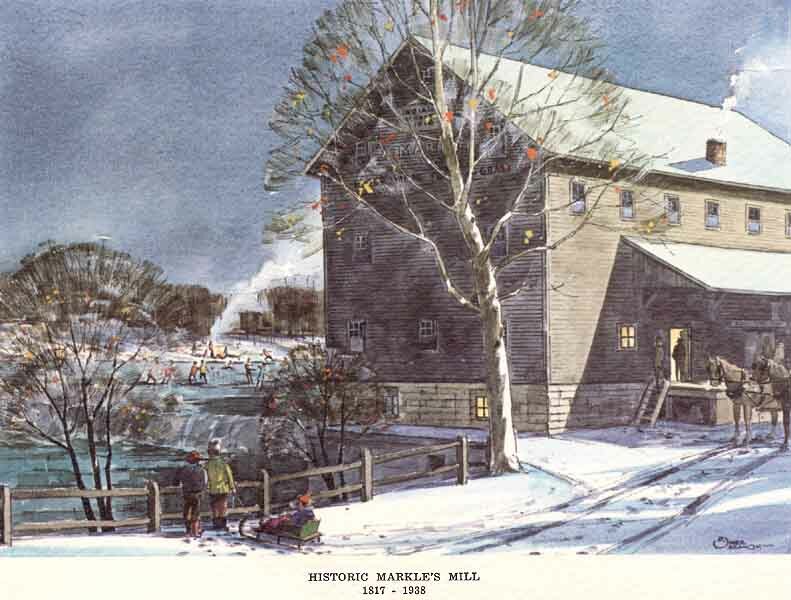 During the first part of the twentieth century, Markle’s Mill became a historical landmark and a source of great local pride. After his conviction and escape, Markle’s land holdings in Canada, which totaled fifteen hundred acres, were confiscated. While still in the army, Markle had traveled on horseback to the Indiana Territory. 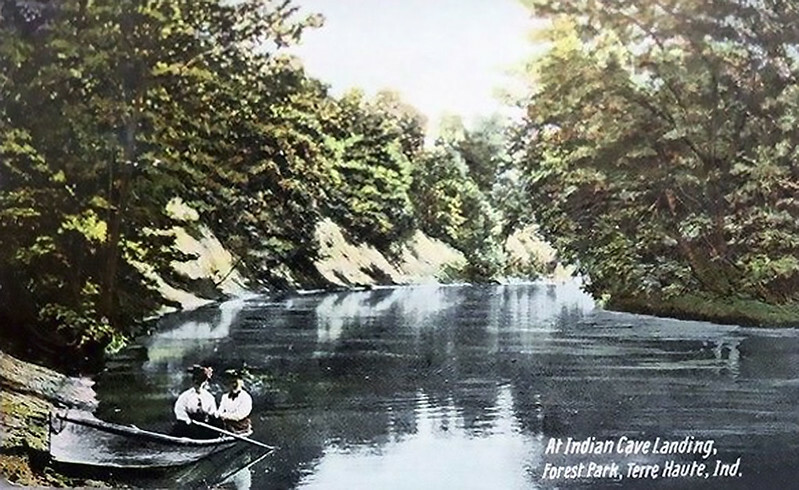 He found the area near Fort Harrison on the Wabash River, which featured thick forests and a fertile prairie to his liking and returned to the east to petition Congress for compensation for the loss of his Canadian land in the form of a land grant in Indiana.11 The governor of New York, James Brown, supported Maj. Markle’s request in a letter to Secretary of War, James Monroe. Major Markle has solicited me to make known to you the situation in which he is now placed after campaign through which he has served with credit. His attachment to the cause of the United States induced him to join our army, leaving in Canada an estate which has been confiscated in consequence. This loss renders him dependent upon his present pay as an officer, and he must rely for remuneration upon the liberality of the American government. Major Markle was a member of parliament of Upper Canada and has probably sacrificed his political as well as pecuniary interest. It seems but just that some equivalent should be offered him in this country. Maj. Markle was following the Terre Haute to Lafayette road (now Fruitridge Ave.) north toward Otter Creek when he decided on the location for his mill.19 The location that he chose was a stream that carried enough water to operate a mill almost all year. On the eastern edge of the Wabash River Valley where the creek came down from the hills the banks of Otter Creek were high enough and close enough together that a dam one hundred yards long could form a pool about six feet deep. One important characteristic of the mill site was the solid rock bottom. John Dickson and Isaac Lambert had built another mill on Honey Creek south of Terre Haute on sandy soil. Within a few years the mill was totally destroyed by spring floods.20 By 1825 there was a second sill built on Honey Creek and another on Sugar Creek near West Terre Haute.21 Most traces of these mills have been washed away by spring floods while the foundation and dam of Markle’s Mill have remained intact to this day. Markle was frequently in the public eye in Vigo County. He was noted for his fiery character and chivalric behavior. He was described by a neighbor who said, "His energy of character was great and he bore down all ordinary opposition by slight effort." After living for ten years in Vigo County. Maj. Markle owned many acres of land. Most of it was mortgaged to provide capital for expanding business interests. 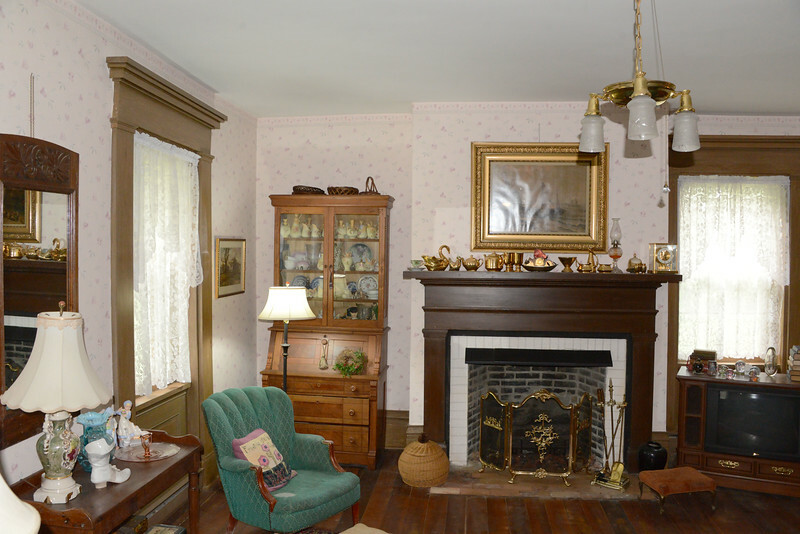 On March 26, 1826 Markle died suddenly at his home. 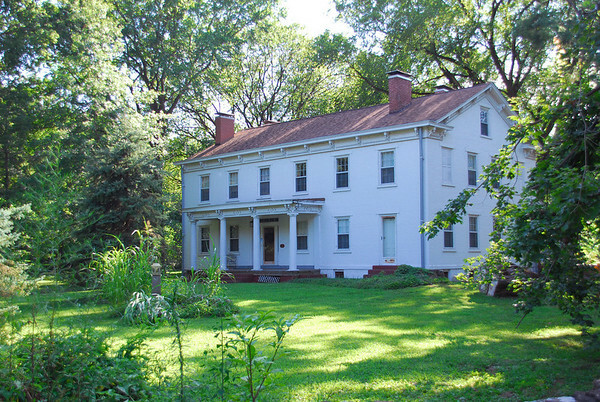 Since he had failed to make his will the handling of Markle’s estate was complicated, and his heirs suffered the foreclosure of a mortgage on three hundred twenty acres between the present day streets of Poplar, Locust, Seventh and Thirteenth. This land which had cost Markle eight hundred dollars was sold to Fredrick Rapp who later sold it to Chauncy Rose for three thousand three hundred dollars. It was from this purchase of land that the Rose fortune grew. The burial service of Maj. Abraham Markle was in charge of Masonic lodge No. 19, the oldest in the city.32 For his ten years spent in the county, Markle is remembered today as one of the areas finest early settlers. Mr. Hansel was very proud of the mill and its background. He carefully preserved letters and documents relating to the mill and began a small historical library in the office of the mill. One of the items that Hansel treasured was a Conestoga wagon. 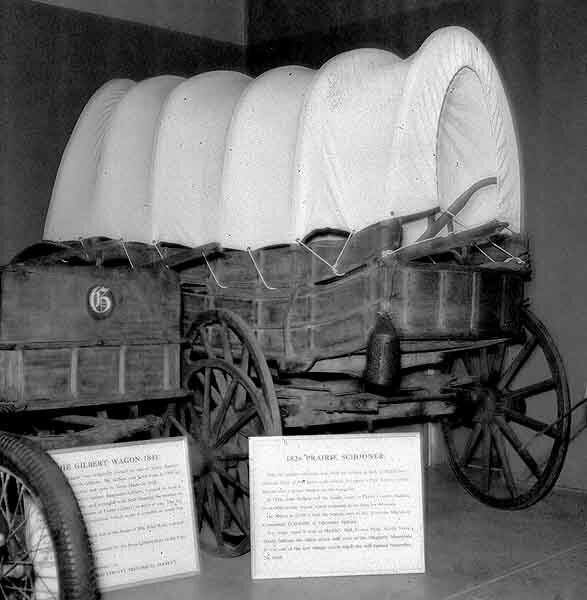 This wagon was sought by the Chicago World’s Fair for a display but never left the mill when Hansel turned down an offer of one hundred fifty dollars for temporary use of the wagon.50 The wagon is now displayed in the Early Wheels Museum in Terre Haute. 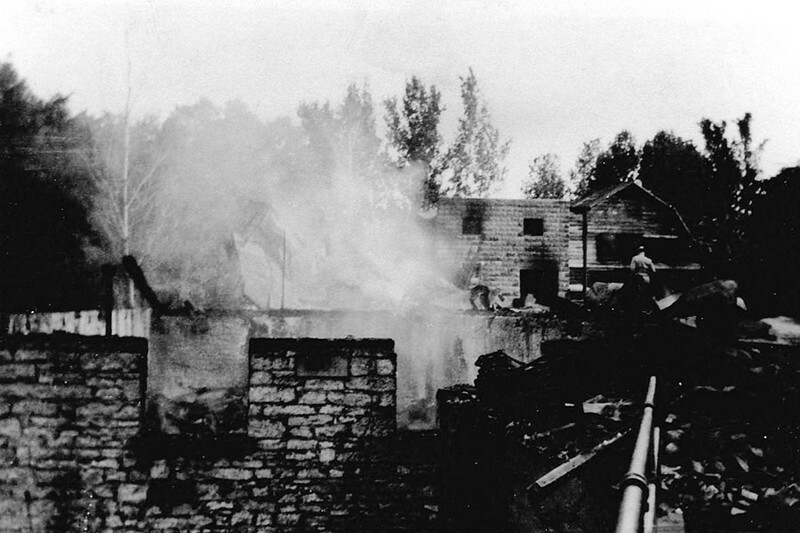 After the fire the mill property was bought by Anton Hulman Jr.. 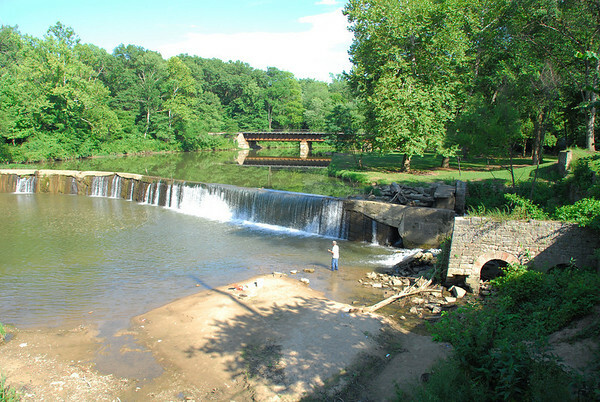 In 1967 the mill site, which included the mill foundation and dam, was made a public park under the proprietorship of the Otter Creek Township trustees. 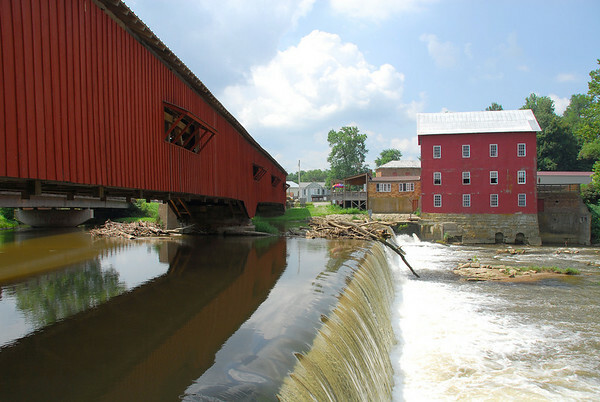 The spot today is a favorite picnic spot for area residents.61 Hansel continued in his profession as miller for a few years at the Bridgeton Mill. Markle’s Mill ground an estimated four million bushels of grain during its one hundred twenty-one years of operation.62 It was able to continue operations over parts of two centuries because it adapted to the demand. 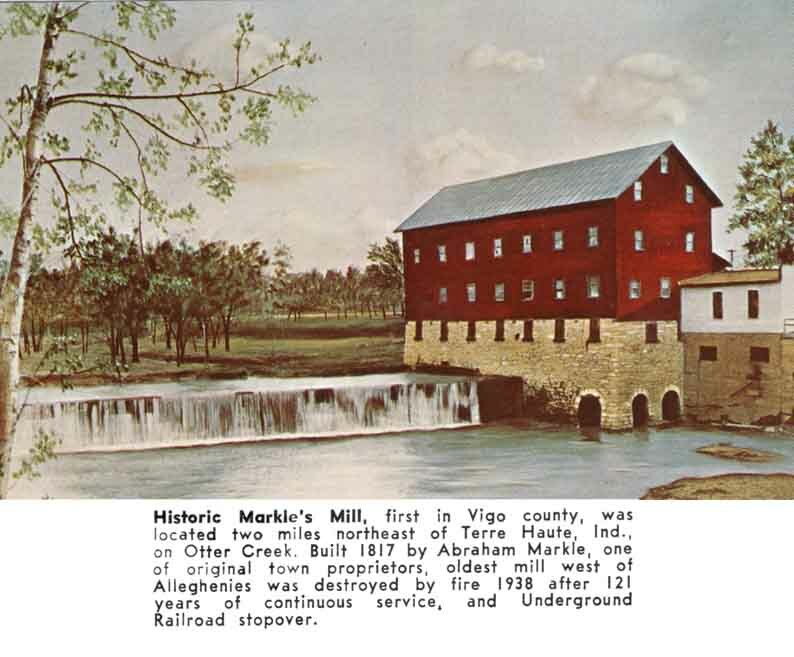 The mill that burned in 1938 was technically far advanced from the mill built in 1817. Most of the owners of the mill were forward looking men who improved the mill operations whenever possible. Markle’s Mill will never be thought of in the same class as Mt. Vernon, as one local writer had hoped, but its contributions to the Terre Haute area will not be forgotten. 1. Bradsly, H. C., History of Vigo County, Chicago, 1891, pp. 157—158. 2. Abraham Markle 1720-1826 (pamphlet) p.1. 3. Markle, A. H, Terre Haute Tribune-Star, May 3, 1931. 4. Abraham Markle, p. 1. 6. Markle, A. R., Terre Haute Tribune, June 1, 1916. 9. Abraham Markle, p. 2. 10. Markle, A. H., "Markle’s Mill 1816—1923, 107 Years" (manuscript). 12. Markle, A. R., Terre Haute Tribune , June 1., 1916. 13. Abraham Markle, p. 2. 21. Ibid, pp. 291, 298. 22. Terre Haute Tribune-Star, May 3, 1931. 23. Oakey, Charles Cochran, Greater Terre Haute and Vigo County, Lewis, 1908, p. 55. 24. 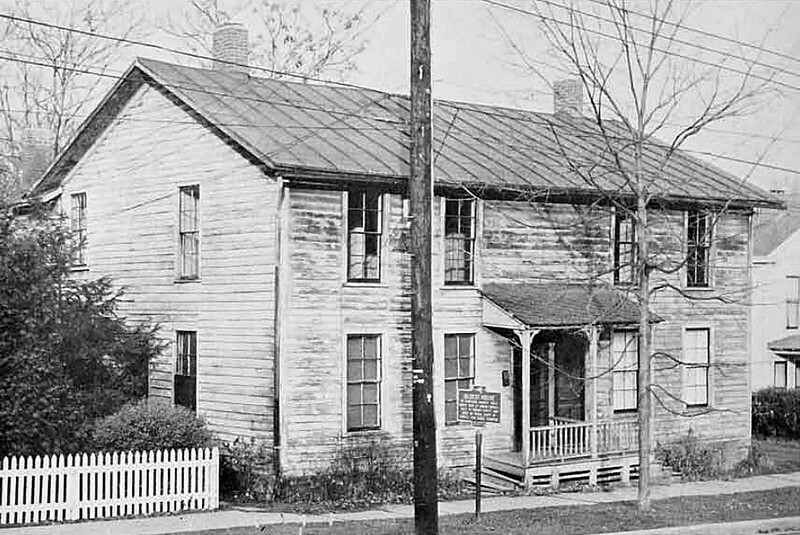 Johnson, Rex, Markle’s Mill (personal notes, Johnson was engineer at Markles Mill). 25. Terre Haute Post , March 25, 1925. 27. National Miller, August 1925. 32. Abraham Markle. p. 3. 36. Terre Haute Post1 March 25, 1925. 37. Caldwell, Terre Haute Star, July 8, 1920. 38. Andrews, Mildred Hansel (daughter of C.D. Hansel) interview on March 31, 1973. 40. Vigo County Journal, April 22, 1925. 45. "Oldest Hoosier Water Mill Is Still in Operation" Indiana Farmer’s Guide, July 12, 1924. 46. Terre Haute Tribune Star, May 3, 1931. 48. Johnson, Bertha(Mrs. Rex), interview on May 10, 1973. 52. Volkers, Clyde E., (from unknown newspaper). 56. Indianapolis News, December 7,1924. 57. Indianapolis Star, September 24, 1935. 59. Terre Haute Tribune, September 21, 1938. Andrews, Mildred Hansel, Interview on March 31. 1973. Bradsly, H. C., History of Vigo County, Chicago. 1891. Caldwell, John, Terre Haute Star. July 8. 1930. Indianapolis News, December 7, 1924. Indianapolis Sunday Star,September 29, 1935..
Johnson, Bertha, interview on May 10, 1973. 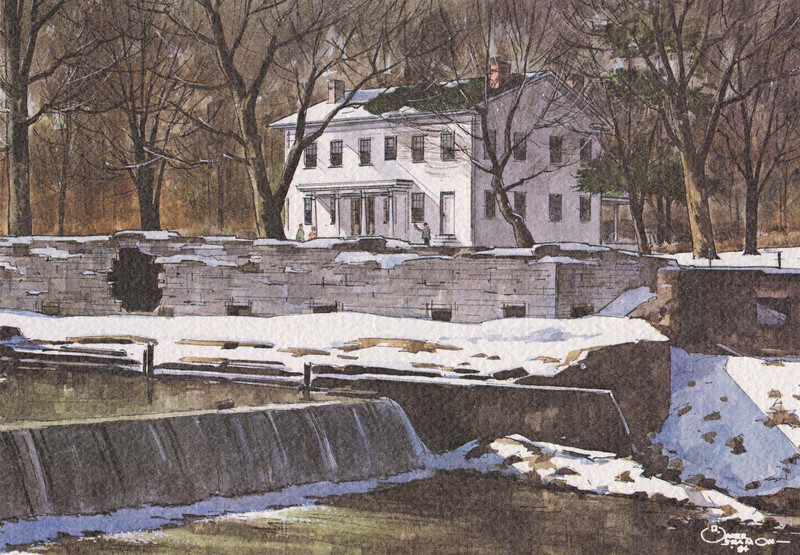 Johnson, Rex, "Markle’s Mill" (personal notes). Markle, A.R., "Markle’s Mill 1816—1923, 107 years" (manuscript). Markle, A..R., Terre Haute Tribune Star, June 1, 1916. Markle, A.R., Terre Haute Tribune Star, May 3, 1931. Oakey, Charles Cochran, Greeter Terre Haute and Vigo County, Lewis 1908. "Oldest Hoosier Water Mill Is Still in Operation" Indiana Farmer’s Guide, July 12, 1924. Terre Haute Post, March 25, 1925. Terre Haute Tribune, September 21, 1938. Vigo County Journal, April 22, 1925. Volkers, Clyde E., unknown newspaper.